Over time there have been certain facts about some legendary horses that for one reason or another seem to become altered, thus creating a deeper mystique. Much of these factual liberties stem from movies made decades after said horse competed. One case in point is the size of the fourth American Triple Crown winner War Admiral, who ran to immortality in 1937. He was known as “The Mighty Atom”, but that nickname was not used in the 2003 movie Seabiscuit, in which War Admiral was portrayed as a large, over 17 hands, powerhouse. Now I am not going to put down the movie here because it was very entertaining and aside from the size of Seabiscuit’s foe, the movie was quite accurate in many other respects. The movie was well crafted and the actors were absolutely brilliant, but because of Hollywood’s penchant for artistic license, many younger people believe that War Admiral was a big imposing colt that was beaten by a small upstart from the wrong side of the tracks. A classic Hollywood scenario. The truth be told, War Admiral and Seabiscuit were in fact very close in size. While War Admiral did lose the famous match race in the 1938 Pimlico Special to Seabiscuit, that loss has become more known to the new generation of racing fans than War Admiral’s stellar racing and breeding achievements. One line from the movie that was the absolute truth about the Triple Crown winner was spoken by actor Chris Cooper portraying trainer Tom Smith. “War Admiral is a great horse”. He certainly was. War Admiral was the best offspring sired by “Big Red”, the legendary Man ‘O War. While Man ‘O War was a big dude at 16.2 hands, War Admiral was built more like his mother Brushup who only stood just under 15 hands. Brushup was sired by Sweep, the champion two year old in 1909 and champion three year old the following year. Sweep in turn was sired by Kentucky Derby winner Ben Brush, an inaugural Hall of Fame inductee. Sweep was also a very good sire, leading the country twice and becoming the broodmare sire of two Triple Crown winners. Man ‘O War needs no introduction to all racing fans. He is acclaimed as the greatest horse in American racing history and his status as a legend is solidified. War Admiral had much of his dad’s will to win and his high strung personality. In appearance he looked more like Sweep in both conformation and colour. This made for a very potent blend of character and talent. Samuel D. Riddle bred and owned War Admiral. He also owned Man ‘O War and Brushup. Riddle was one of the most prominent turf icons in American history. He was very protective of his great horse Man ‘O War and during the horse’s stud career was very selective as to which mares Man ‘O War covered. He bred Brushup to his champion six times with five of the resulting foals being fillies and of course the only colt War Admiral. The mating of War Admiral’s parents created a totally out crossed, within five generations, pedigree for War Admiral. His sire was inbred on the fifth generation to both Galopin and Hermit, while his dam sire was inbred 4×4 to Alarm and 5×5 to Lexington. War Admiral’s dam Brushup was a half sister to War Glory by Man ‘O War, and a close relative to Hall of Fame member Eight Thirty. War Admiral would become the star of this family. George Conway was the trainer for the Riddle stable when War Admiral began his ascent to stardom. Conway had worked as the stable foreman under trainer Louis Feustel during Man ‘O War’s immortal racing career. 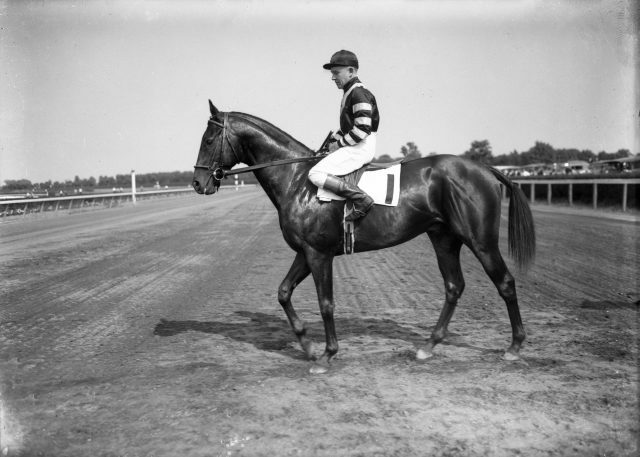 He had War Admiral ready to make his debut in a four and one half furlong maiden special weight race on April 25, 1936 at Havre de Grace. The colt won by a nose over Sunny Grove. He followed that with a two length win in an allowance race at Belmont in 58. 4 and he then finished third in the National Stallion Stakes to eventual juvenile champion Pompoon. Following a second place finish in the Great American Stakes, Conway gave War Admiral a bit of a rest, returning the colt to racing for the September 19 running of the Eastern Shore Handicap at Havre de Grace. War Admiral became a stakes winner on the day with a dominating five length victory. One more start would come before the end of the season, which saw War Admiral finish second on a muddy Laurel track. By now future Hall of Fame inductee Charlie Kurtsinger had become the regular rider for War Admiral. The pair would enjoy an outstanding season together, in which both horse and rider reached the pinnacle of success. War Admiral made his three year old début at Havre de Grace winning twice in a ten day span. The second race victory was in the Chesapeake Stakes. The race chart stated that he was Easily Best. Riddle then decided to amend his reluctance to enter a horse for the Kentucky Derby, and agreed to Conway’s suggestion to point War Admiral for the big race two weeks after the colt’s Chesapeake triumph. Samuel Riddle had famously not entered Man ‘O War in the Kentucky Derby stating that in his opinion “Carrying 126 pounds over ten furlongs on the first Saturday in May is too much for a developing three year old to compete in”. Man ‘O War won the following Preakness Stakes and Belmont Stakes, thus triggering a debate for the ages that Man ‘O War would have been the second Triple Crown winner in history had he started in the Derby. Riddle’s change of heart in entering of Man ‘O War’s son War Admiral became a significant decision affecting War Admiral’s legacy. War Admiral was sent to the post as the betting favourite by the Churchill Downs punters and took the lead early in the race. He was never seriously challenged and won the Kentucky Derby by one and three quarters of a length from old foe Pompoon, with the good colt Reaping Reward another eight lengths further back in third. The Preakness Stakes was due in one week, so Conway brought War Admiral to Pimlico right after the Derby victory. Many experts of the day were of the opinion that the Preakness, with its shorter distance, would be more suitable for Pompoon than the Derby. They were right but, War Admiral other ideas. Kurtsinger had to push his little colt hard and The Mighty Atom responded by switching to top gear to hold off Pompoon by a head to capture the second Triple Crown jewel. War Admiral’s victory was the first Preakness triumph for a son of a Preakness winner. Now he was in line for the Triple Crown. Could any horse stop him? Apparently not. War Admiral dominated the twelve furlong race in his customary fashion by taking the lead early and dictating the pace. The margin of victory was charted at three lengths, although many in attendance believed he could have won by more had the colt wanted to. America now had its fourth Triple Crown winner. Before the start of the Belmont Stakes, War Admiral displayed his fractious behavior, which he was known to do frequently, at the starting gate. He broke through the barrier twice before the start thus delaying the proceedings. When the race did get off to a fair start, War Admiral stumbled out of the gate and sheared away an inch of his right fore hoof. He ran the one and half miles with blood squirting out from the injury. When one considers this and the way in which he dominated the race, War Admiral’s Belmont must be considered as one of the all-time greatest performances of speed, guts and will to win displays in racing history. War Admiral would be laid up for more than four months while he healed from the injury. George Conway had him ready for an October 26 return at Laurel. Four days later The Mighty Atom ran in the Washington Handicap at Laurel and then a week after that start again for the Pimlico Special. War Admiral won them all, thus completing a perfect eight for eight three year old campaign and earning Horse of the Year in the U.S. Riddle announced that his champion would return for another year of racing. The fabled Hialeah was the scene for War Admiral to make his seasonal début in an allowance race setting him up for the prestigious Widener Handicap at the same venue. In the Widener, War Admiral was eased up at the finish line due to being so far ahead Kurtsinger did not want to needlessly push his mount further. The Mighty Atom then made it eleven consecutive victories three months later carrying 132 lbs in the Queen’s County Handicap at Aqueduct. At Suffolk Downs three weeks after his Aqueduct win the streak ended in the Massachusetts Handicap. War Admiral tackled a heavy rain soaked track and could do no better than fourth to the classy Menow. War Admiral carried 130 lbs in the race. The three horses finishing ahead of him carried twenty-three pounds less over the tiring track. War Admiral got right back in the winner’s circle after this set back, reeling off five consecutive victories. In order he captured the Wilson Stakes, Saratoga Handicap, Whitney Handicap, Saratoga Cup and the two miles long Jockey Club Gold Cup. Among the quality horses behind him in these races were Fighting Fox and Esposa. However there was another horse winning races all over the country that was looking to engage the champion, his name was Seabiscuit. Negotiations to meet in a match race had been taking place between Samuel Riddle and Seabiscuit’s owner Charles Howard. The Pimlico Special was chosen for the historic event. The purse for the race was doubled and the anticipation reached a fever pitch. NBC broadcast the duel live on radio and the Pimlico grounds were overflowing with excited racing fans. The country literally came to a stop as millions listened to the race call. Seabiscuit surprised War Admiral when he took the lead from the start, which was not his usual style. War Admiral gained an advantage along the back stretch, but Seabiscuit regained the lead and won the “Match Race Of The Century” by four lengths. With the spectacle now over, Conway prepared War Admiral for his next engagement. The Rhode Island Handicap at Narragansett returned The Mighty Atom to the winner’s circle and closed out his 1937 season. Due to his loss to Seabiscuit in the match race, War Admiral did not garner any awards for his outstanding campaign. Staying in training, War Admiral started in an allowance race at Hialeah on February 18, 1939. He won the seven furlong tilt, but was to be his last race. He spiked a fever not long after and then wrenched an ankle when returned to training. Riddle decided to retire his champion to stud. War Admiral was given time to heal and wind down, so he did not begin his stud career until the following year. Further success for War Admiral would come his way in the role as a breeding stallion. War Admiral stood at Riddle’s Faraway Farm in Kentucky. Whereas Man ‘O War had been used essentially a private stallion to Riddle and his family’s mares, War Admiral was a more accessible stallion to outside mares. This was significant for the horse to become a leading sire in America. War Admiral led the general sire list in 1945 and was twice the leading broodmare sire in America. He sired three hundred and seventy-three foals. Two hundred and fifty-one became winners with forty of those winning stakes races. Because he was available to mares beyond the Riddle realm, War Admiral had great success with mares from the epoch family of La Troienne. His champion daughter Busher, bred and owned by Col. E.R. Bradley, was out of La Troienne’s daughter Baby League. Another high class filly sired by War Admiral was Busanda, who was out of another La Troienne daughter named Businesslike. Busanda later produced the exquisite champion and successful sire Buckpasser. A few other notable names in racing history stemming from War Admiral include champion son Blue Peter, Bee Mac (dam of Better Self and Riverina), multi stakes winner and good sire War Jeep, stakes winner and broodmare of the year Striking, and Hall of Fame inductee Searching (dam of Affectionately, Priceless Gem and Admiring). Major stakes winners Navy Page, Cold Command, Admiral Vee and Busher’s brother Mr. Busher enhance the sire reputation of War Admiral. Further down the line we see War Admiral in the pedigrees of champions Numbered Account (in bred 3×4), Dr. Fager, Swaps, Iron Liege, and fellow Triple Crown winners Affirmed and Seattle Slew. For contemporary racing fans the latest Triple Crown winner American Pharoah has War Admiral in his pedigree eight times, although many generations removed. Samuel Riddle passed away in 1951 at the age of ninety. His estate continued to stand War Admiral until 1958 when the great horse was moved to nearby Hamburg Place then owned by Preston Madden. War Admiral himself passed away the following year of his relocation. He was buried at Faraway Farm beneath the foot of his sire Man ‘O War’s grave. These graves have since been relocated to the Kentucky Horse Park, where visitors can pay homage to the great father and son combination. War Admiral was Man ‘O War’s best son on the track and most influential son at stud, despite not having a son of his own to carry the baton to future generations. War Admiral’s influence through his daughters is a major factor toward many exulted names in the stud book. A litany of champions descends from this one horse, which is no coincidence. Although he looked more like his maternal grandfather Sweep, War Admiral had his father Man ‘O War’s attitude and talent. The Mighty Atom stood only 15.2 hands, despite what Hollywood would lead us to believe, and was a tough, fast, honest competitor on the track. War Admiral was as one of the twentieth century’s best race horses and an all-time legend. Amazing horse. I do not like how they run the animals until they have a devastating career-ending injury or die.